Japan has many traditional rites that up to now are still being practiced. One of them is Seijinshiki or the coming of age of Japanese girls. 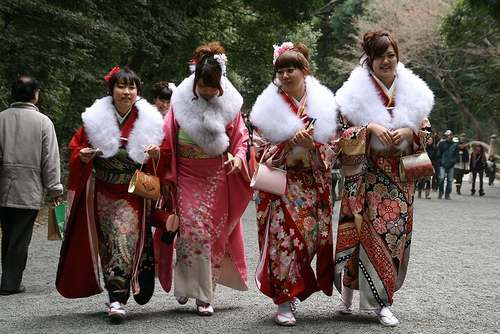 This so-called Coming of Age Day honors Japanese ladies as they turn 20 years old and enter adulthood. It is a yearly national holiday that takes place every second Monday of January. To celebrate their becoming adults, the ladies are encouraged to develop self-reliance to become responsible citizens of their society. Ladies qualified to attend the Coming of Age Day are those whose 20th birthday is between April 2 of the past year and April 1 of the present year. Unlike in other countries which consider 18 as the legal age, the proper age a Japanese enters adulthood is 20. At the age of 20, a Japanese adult already has the right to vote and can drink and smoke. During this particular day, females go around town wearing the traditional furisode or a special type of kimono worn only by unmarried women and the zori sandals. It normally has extra-long sleeves and elaborate designs but most often, they are just borrowed because a full set of this formal traditional dress is expensive. Some even book appointments one year in advance. Many women prefer to use the services of a salon in order to properly wear the kimono and set their hair. The ceremonies for this coming of age day are held at the local town halls and offices. Parties with family and friends are the norm after that. This year, some 1.26 million people celebrated their coming of age, up by 50,000 from the 2014 figure. The Seijinshiki event has been observed since the 714 AD. During that time, a young prince started wearing new robes and hairstyle to mark his entry into the adult world. The national holiday, however, was established only in 1948. Back then, it was held on a specific day every January 15. In the olden days, boys in Japan marked their passage to adulthood at the age of 15 while it was 13 for girls. During the Edo period between 1603 and 1868, boys celebrated their coming of age by having their forelocks cropped off. The girls, on the other hand, had their teeth dyed in black. It was only 1876 when the legal age was changed to 20. In the past, those who take part in this event are exactly 20 years old. Today, though, most are only 19 years old and about to turn 20.